For some players, learning to play guitar by themselves is really the only way to go. Guitar lessons have their place, and there is no substitute for an experienced teacher or mentor who is committed to helping you reach your goals. But there are also some good reasons to skip the lessons and forge your own path. The day I took my last lesson from that guy I remember him saying it was too bad I had decided to quit guitar. I wasn’t quitting guitar, far from it. I had simply decided to find my own way and leave this instructor in my wake. My path was crooked, and my mistakes were many, but looking back I’ve come up with a few decent suggestions for new guitar players. This post contains my best advice for musicians who want to go it alone, without an instructor, and teach themselves to play guitar. There are many different ways to learn about the guitar. 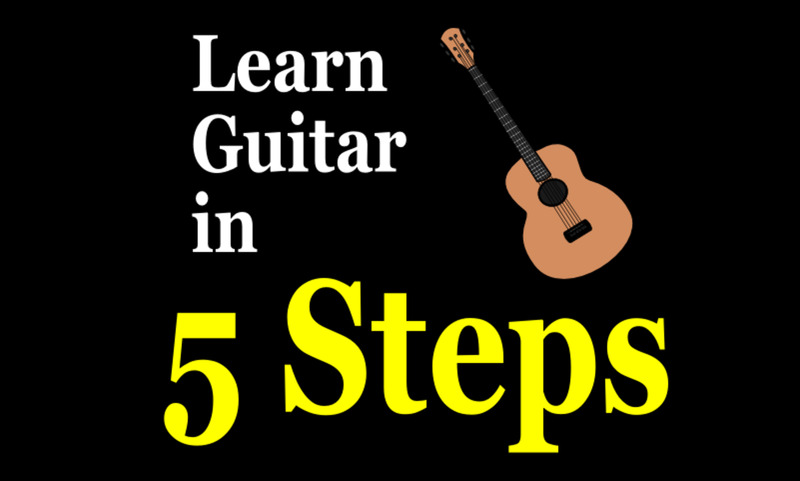 Here are 5 steps for learning to play guitar by yourself. The first thing you should learn as a new guitarist is how to tune the thing. Obviously it makes no sense to spend hours practicing on a guitar that doesn’t sound right! But keeping your guitar in tune has additional benefits, especially for a new players. The open strings of a guitar tuned to standard concert pitch, starting with the 6th (fattest) string, are the notes E-A-D-G-B-E. I suggest getting an inexpensive digital tuner and learning how to use it. It will show you how to get those strings perfectly in tune, and you’ll know your guitar is at pitch every time you practice. But you should really learn to tune your guitar by ear. Using the digital tuner (or a piano, pitch pipe, tuning fork or whatever else you have) you can tune your low-E string to concert pitch. Then, using the low-E, which you now know is in tune, you begin to tune the rest of your guitar. You will repeat this with every string until your entire guitar is in tune. The only exception to this rule is the 2nd string (B), which you will tune to the 4th fret of the 3rd string (B again). 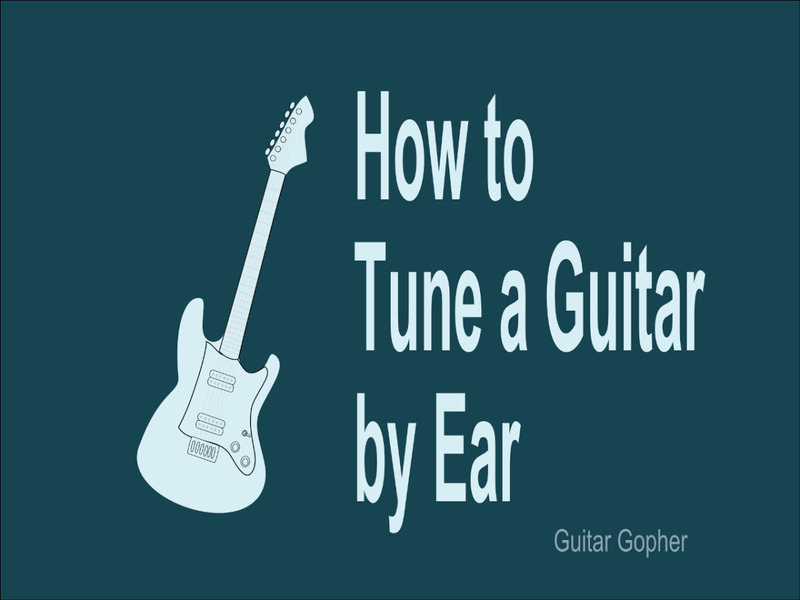 Learning to tune your guitar this way helps you tremendously when it comes to getting an ear for music. Personally, I also think my guitar sounds better when I tune it by ear. Making sure your guitar is always in tune has one more benefit, and it comes in the form of one of the great epiphanies I ever had as a young guitar player: As long as your guitar is in tune, you can theoretically play anything you hear another guitar player play. Realistically, it will be a while until you are ready to attempt Van Halen’s Eruption. For now, you need to get some basics under your belt. When it comes to guitar, there sure are a lot of basics. But you’re going to want to concentrate on the basics that will get you playing as quickly as possible. We’re not looking for shortcuts here. 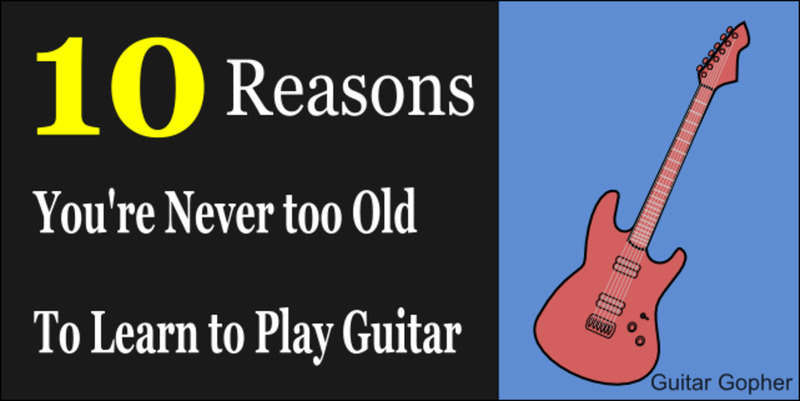 Your road as a guitar player will be a long one no matter what, and you can spend a lifetime playing and practicing and never truly master the instrument. However, I think one of the things that most frustrates new guitarists is the attention to detail instructors sometimes spend when teaching the basics. I recall starting off learning three notes on the E string. Important for sure, but as a new guitarist you want to play. So that’s what we’re trying to do here: Get you playing as soon as possible. I advise investing in a basic beginner’s guitar manual, if one didn’t come with your starter guitar. If you can’t or don’t want to do this, you can certainly find all the information you need out there on the internet. There are several goals here: First, you want to learn the correct way to hold the guitar and the pick, and the correct way to strum. Bad form is a habit that is hard to break, so you want to start off right. Mentally, you can learn all of these chords in a week if you work at it. Physically, it will take a long time to get good at them. Your fingers will not be used to contorting in such positions and you are going to have to be patient until your muscles catch up to your brain. You can sit staring blankly at a wall and strumming each of these chords for hours every week if you want to. I wouldn’t. 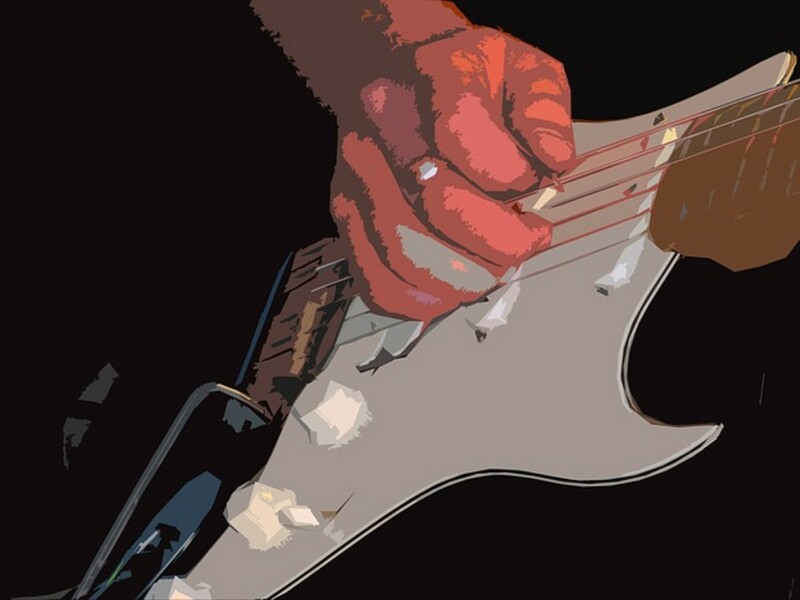 There is a much more fun way to work on your chords and improve your playing. Chances are you didn’t decide to be a guitar player so you can learn chord names by rote and spend endless hours working on rudimentary strumming drills. You want to play music! By learning some of these songs and playing them you are working on your chords in the context of real music. Most transcribed songs also have a list of the chords you’ll need to know at the beginning, complete with diagrams of how to play them. 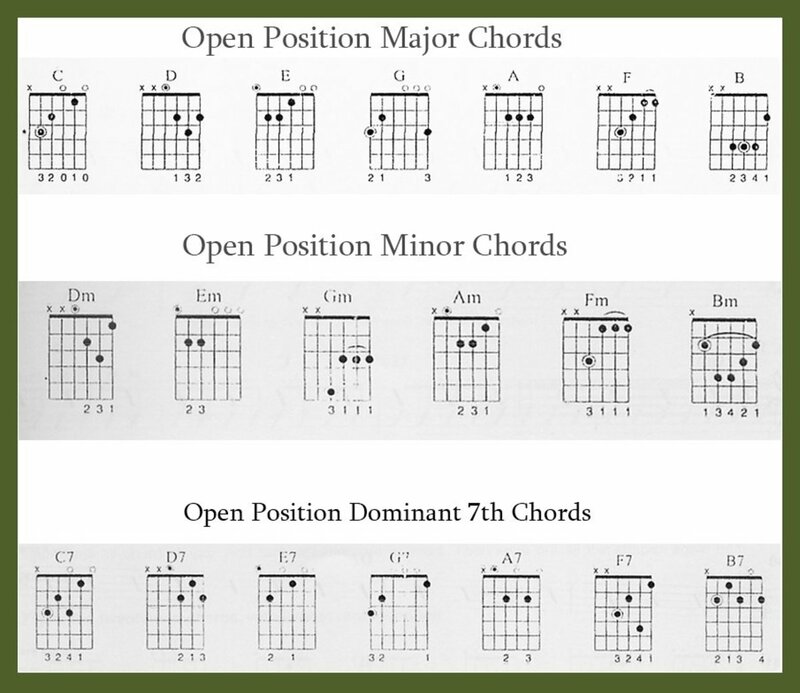 This is a great way to learn new chords and expand your knowledge. Once again I emphasize: This will not be easy. You will stumble and bumble and possibly curse a lot. Learning guitar is hard work, no matter how you do it. But at least you will get a little inspiration from learning songs you like instead of taking lessons for months just to learn to play Twinkle, Twinkle Little Star on one string. 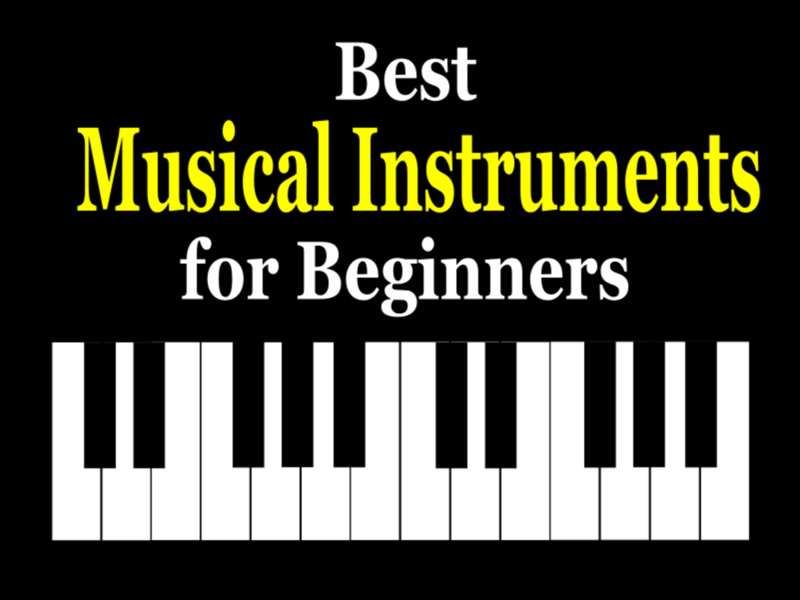 If you need a starting point, there are some excellent easy songbooks out there for beginners. 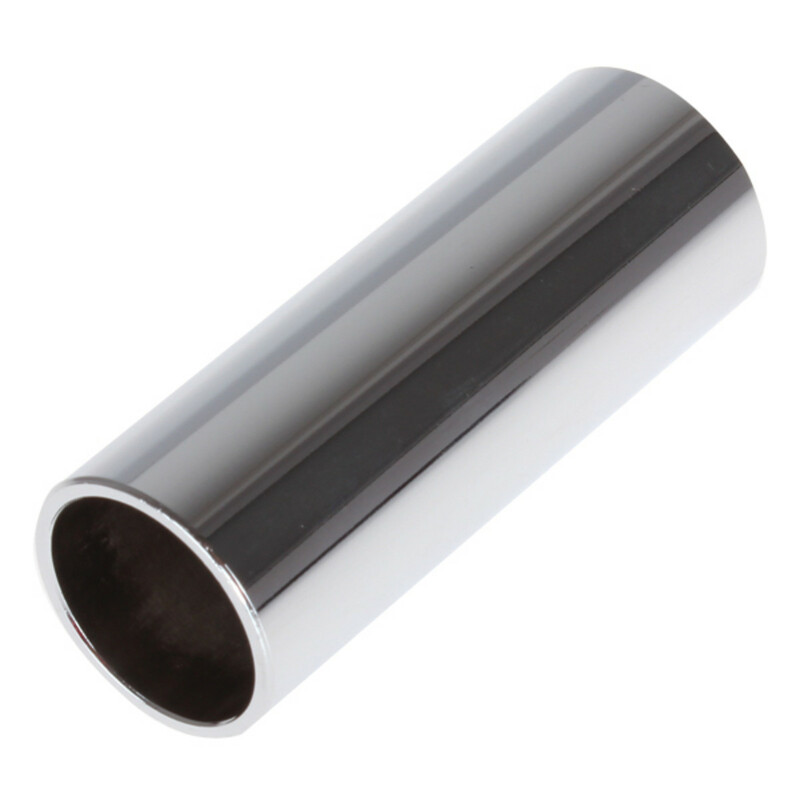 These will provide enough of a challenge while helping you to play real music you will enjoy. The Guitar Tab White Pages series has long been among of my favorite collections of music. There are many different versions covering every genre and style. There's even an Easy Guitar version available that's perfect for newbie guitarists. While you can start playing real songs on guitar relatively quickly, getting deeper into the instrument takes even more work. You are eventually going to want to be able to play solos and possibly even learn how to improvise. That’s a little ways off for a beginner, but there is no reason you can’t begin to lay down the foundation. This means working on your fretting and picking-hand dexterity. I’ve found the best way to do this is to learn scales and practice them daily. However, you may not be up for that just yet, and that’s okay. Another much simpler method is the daily practice of a drill called the Chromatic Exercise. When you are done with the sixth string, move to the fifth string and do the same. When you are done with the fifth, then move to the fourth, then the third, then the second, and finally the first string. You can even do this while you are watching TV with your guitar unplugged. The more time you can spend with it the better. Before long, those single-note passages you avoid when learning a new song won’t seem so scary, and you will have the skill to pull them off. This is also an excellent warm-up exercise. Believe it or not, injuries can and do happen when guitar players do not warm up properly. To Get Better at Guitar You Must Play Guitar a Lot! You know, I used to try to teach my friends how to play guitar when they’d ask. However, I soon learned a few important things, not only about learning guitar but about people. A lot of people have the idea that to learn something requires a teacher, and it is up to that teacher to make sure they learn. They think they can show up, do only what is required, not touch the instrument between lessons, and somehow get good at guitar. Just as a teacher requires homework in school, you have to do your homework when you are learning guitar. In fact, learning guitar is about 90% homework, and if you don’t have the ambition and drive to spend time practicing and playing you aren’t going to get very far. Whether you choose to take lessons or teach yourself to play guitar, you have to put in the time beyond the instructional material. The more you play the better. It is true that there are ways to regiment you practice sessions to make the best use of your time, but there is no substitute for hours spent with the instrument. Needless to say, my days as a guitar instructor didn’t last long. I had a lot of trouble seeing how someone could say they want to get good at something and then not have the initiative to put in the time. For a long while now, when someone asks me to teach them to play I simply give them the same advice I'm giving you in this article. Work hard. Play a lot. You will get good. If you want to ignore everything I said in this article and sign up with a guitar teacher instead there is sure nothing wrong with that. Some people may prefer an instructor, and some guitar teachers are excellent. Not every instructor is like the guy I had as a kid. Some are very in-tune with the needs of their students and tailor their lessons accordingly. 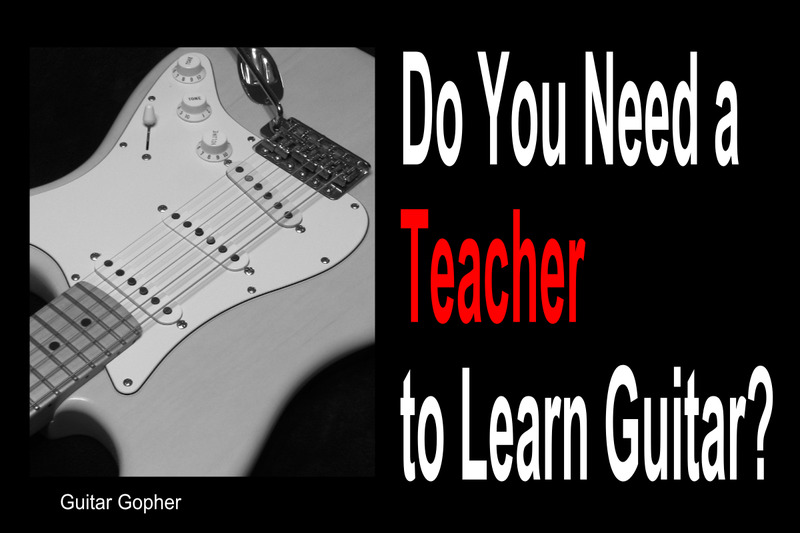 If you are lucky enough to line up a guitar teacher who totally understands you and is able to get you going on the right path there are few better ways to learn guitar. But if you can’t find a good teacher, or if you don’t have the coin, or if you have given up on lessons for any other reason, try my method. Learn to tune your guitar by ear. Start to build a vocabulary of basic chords. Practice chords by playing songs you like. Work on the Chromatic Exercise daily. You will soon move beyond the stages where this information is helpful to you, and then it will be time to learn a little about music theory, scales, modes and all that good stuff. At that time you may want to revisit the idea of hiring a guitar teacher. For now, this ought to get you off to a good start. Good luck! If you work hard you can make your guitar dream come true! Thanks Eric! Obviously there is bit more to it, but that's the bottom line. Hi Lynn - There are pros and cons to both used and new guitars for beginners. Buying a new guitar means you get a warranty and likely better resale value if you decide the instrument is not for you. On the other hand, for the same price you can get a better guitar all-around if you can buy used. The problem is most new guitarists don't know what to look for or how to judge a used instrument, so I usually recommend going new. But, if you have a friend who can help you evaluate a used guitar and make a smart choice, you may wish to go the used route. @Gatorman - I'm glad you find this article helpful and I wish you the best of luck. The biggest and most important tip I can suggest is to never give up. Just keep trying, even when (and especially when) it seems like you're just spinning your wheels. As for getting intimidated by more experienced guitar players, that just goes with the territory. No matter how long you play, there is always someone better than you. These are people you can learn from. Ask them questions if you can. If not, just watch what they do. It may be confusing at first, but the pieces will come together. One of the downsides to teaching yourself guitar is finding those ways to challenge yourself. Don't shy away when you encounter them. They are what makes you better. @Sam - I think it is unlikely that you, or anyone, is too dumb to learn guitar. It does sound like you have some issues with self confidence, though. Sometimes small victories help to build our confidence so we can take on larger and larger tasks. Guitar instruction manuals are often set up in a very linear way, which means you usually have to get through a lot of boring stuff before you can enjoy playing guitar. Some people learn well with that kind of method, where others (like me, and I'm guessing you) struggle. That's one of the reasons the steps in this article are set up in the way they are. I want people to start playing as soon as possible, so they are motivated to stick with the guitar take on harder and harder concepts. So, give it a try. Learn to tune the guitar, learn some chords, and start playing songs. Take it easy, don't be too hard on yourself, and you'll get there. I never played guitar in my life.I'm 66 now and retired so I went down to a pawn shop and bought a Fender Strat because they look cool.I tried to practice on it but the more I tried the harder it got.I've always had trouble learning stuff and this is no exception.Maybe I'm too dumb to learn how to play. Could that be the case? Thanks, Les! Glad you found this helpful. Good luck getting back to guitar. I think the biggest "secret" is just to keep on playing and never give up. Just the kind of thing I'm interested in. I started to try learning a few years back. I've not done much recently but this might re-inspire me to continue. @Amykins42 - Thanks for the kind words. A good teacher is very important - if you can find the right one. Glad you love the Yamaha. They are some of my favorite beginners-level acoustics. Good luck and keep on practicing! Love your article, now I have some things to work on on top of that... tuning is a bit flat so far lol and my chromatic scales are slow... first week is fun. Thanks Stella! I sometimes wish I had found a good teacher from the beginning, but I suppose we all must travel our own path. I agree the number-one thing is to put in the time and work hard.